By Chris Williams: While some boxing fans are excited about WBC/WBO bantamweight champion Nonito Donaire (26-1, 18 KO’s) taking on unbeaten WBO super flyweight champion Omar Narvaez (35-0-2, 19 KO’s) on October 22nd, I’m not one of them. The Donaire-Narvaez fight will be taking place at Madison Square Garden in New York, Donaire’s promoter Bob Arum reported today. Narvaez, 5’3″, is a whopping four inches shorter than the 5’7″ Donaire and fights in a division below him. Narvaez is actually shorter than Donaire’s last opponent the 5’4″ Fernando Montiel, not as powerful nor as fast as Montiel. When you sum up this fight, this is just another easy fight for Donaire. Narvaez is slow, short, and a lot weaker than Donaire. It’s just another mismatch. Donaire plans on moving up to the super bantamweight division after he faces the super flyweight Narvaez in October. The super bantamweight division has exactly four good fighters: Jorge Arce, Wilfredo Vazquez Jr., Toshiaki Nishioka and Guillermo Rigondeaux. Donaire needs to fight Rigondeaux and then move up to featherweight so he can fight Yuriorkis Gamboa. That’s the fight that Donaire’s promoter Bob Arum has been talking about for next year. I think Donaire has a reasonable chance of getting to that fight in one piece if he can beat Rigondeaux. Gamboa, of course, will destroy Donaire but that’s besides the point. I just hope Arum doesn’t waste more time for Donaire by putting him in with Arce, Vazquez Jr. or Nishioka. Those are three good fighters but not in the same class as Rigondeaux, who I think has the talent to give Donaire a lot of problems. Narvarez will be just another Montiel-type opponent for Donaire. He’s way too small to compete with him. 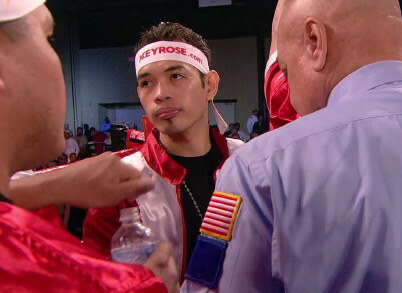 I just wonder what’s going to happen to Donaire once he starts facing guys his own size? He’s good against guys that are four and five inches shorter than him but I really question whether he’ll be able to dominate when he starts facing guys that are routinely as big as him.